“Spirited Republic” is sure to attract many visitors with its novel subject matter, which benefits from sponsorship by the History Channel and several alcohol industry trade groups. Before entering completely, visitors are greeted by dozens of gallon jugs mounted to panels representing declining annual alcohol consumption from 1830 to (an apparently arbitrary) 1978. To flesh out these figures, the main exhibit series is divided into four chronological parts: “Good Creature of God,” illustrating alcohol’s place in colonial America and the Early Republic; “Demonizing Drink,” showing how nineteenth century reformers inserted Temperance into the national conversation; “Sober Nation?,” chronicling the saga that was Prohibition; and “Conditional Acceptance,” highlighting the role of alcohol since Repeal in 1933. Each of the four areas features some non-document artifacts but primarily uses printed sources alongside contextualizing placards. 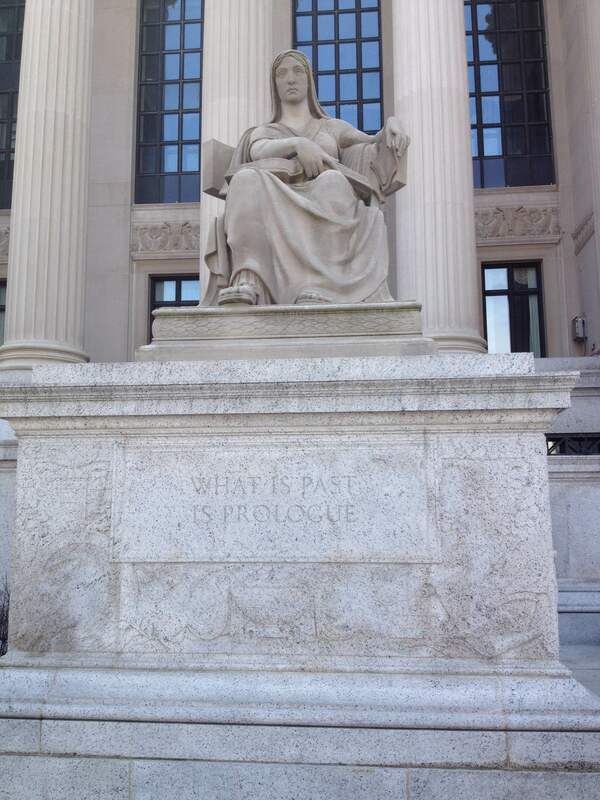 (What else would you expect at the National Archives?) The first section, “Good Creature of God,” briefly acknowledges alcohol’s broad barter function before the American Revolution. Perhaps it is only fitting that an alcohol history exhibit in the nation’s capital reminds us that taverns were hotbeds of anti-British sentiment on the eve of the Revolutionary War. We are treated to contemporary import records, travel manifests (including some from Meriwether Lewis, who procured thirty gallons of wine among other intoxicating beverages for his fateful exploration with William Clark), Continental Army pay slips consisting entirely of spirits, and early, relevant patent applications such as one for Adolphus Busch’s renowned pasteurizer. 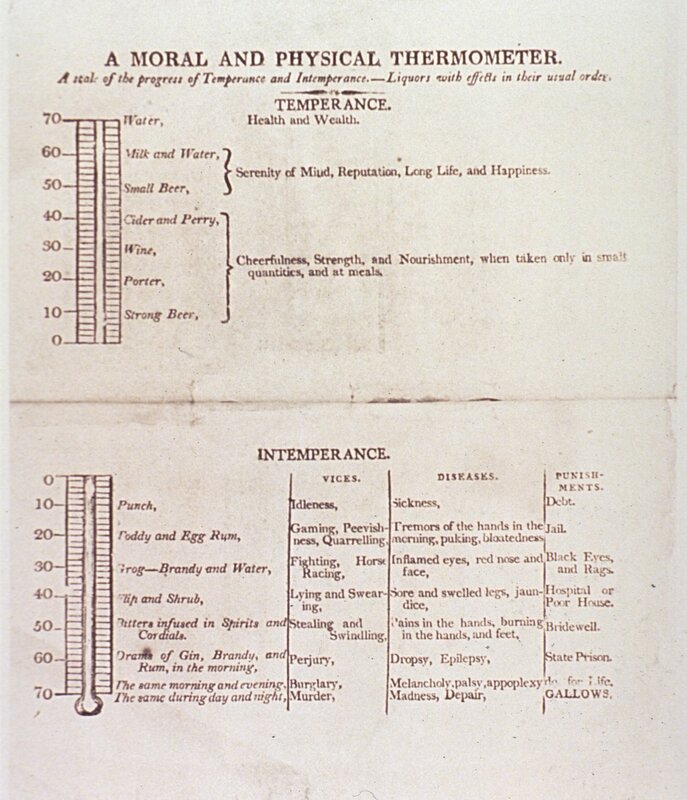 The next area, “Demonizing Drink,” places Benjamin Rush’s iconic “Moral and Physical Thermometer” (1784) front and center. Its placard explains that by the late eighteenth century, nascent ideas about alcohol’s lethal, disorderly, and addictive potential were circulating in medical, evangelical, and capitalist discourse. Still, these exhibits partially slight two critical temperance constituencies: women (though some Women’s Christian Temperance Union materials are present among others) and WASP nativists (though it is noted that many immigrant groups opposed prohibition). Partially making up for the lack of Indian presence in the first section, “Demonizing Drink” also displays some moral reformers’ efforts to stem alcohol sales to tribes like the “Stockbridge” (or “Muh-he-connewee”) Indians, who in 1822 fled rampant liquor trade in New York and resettled in what is now Wisconsin. Other notable documents include disciplinary records for alcohol-related misconduct in the U.S. Navy and its subsequent abolition of liquor rations, advertisements for temperance lectures, and hospital registers of patients suffering “dipsomania,” a proto-addiction concept characterized by irresistible craving for alcohol. The introductory narrative to the next section, “Sober Nation?,” interprets Prohibition as a noble cause that might have worked were it not for the quick takeover of the illicit liquor trade by organized crime and the high cost of enforcement, particularly as the Depression took hold. Photographs and brief biographies introduce us to some agents on the front line, with some attention to the few immigrants, blacks, and women among them. The exhibit attributes their ultimate ineffectiveness to having few in numbers, relying on patronage appointments to fill ranks, and of course corruption. (An explanatory placard notes that the bureau “became more professional” after 1925, but does not elaborate how.) A fascinating artifact in this section is the “Illustrated Map of the Tenth Prohibition District, Showing the Conditions in Each County as to Public Sentiment, Illicit Distilling and Unlawful Stills, Transportation and Possession” (1930), which included the states of Louisiana, Mississippi, Alabama, and Florida and color-coded their counties by frequency and severity of offenses. The lily-white hues of many rural Florida areas in particular raises questions of alcohol prevalence and the limits of state power. Other documents of note include the joint resolution proposing the Eighteenth Amendment to the states, clever advertisements for alcohol as a prescribed medicine, and Franklin Roosevelt’s campaign materials promoting his intent to repeal Prohibition. Finally, the last section, “Conditional Acceptance,” shows how American society has treated alcohol since the 1930s. The resolution proposing the Twenty-First Amendment is one of the first items on display, neatly bookending the previous theme. Photographs, tax records, advertisements, and a colorful assortment of dozens of contemporary beer labels drive home American enthusiasm for Repeal. Not even World War II could dampen love for drink, which crafty marketers pitched as one of the “little things worth fighting for.” This section then jumps over two decades and resumes its narrative through the anti-drunk driving campaigns of the 1970s and 1980s. One glass case contains prototypes for the breathalyzer (invented in 1955), but the message is mostly derived from print materials put out by groups such as Mothers Against Drunk Driving and looping public service announcements featuring then-famous athletes. The final displays are essentially cautionary tales: an ad featuring Betty Ford saying that she is “living proof you don’t have to die for a drink,” a poster warning mothers-to-be about the dangers of Fetal Alcohol Syndrome (written in Spanish, a reflection of demographic trends), and a case full of recovery literature including the Big Book of Alcoholics Anonymous and correspondence between famous addicts including First Lady Ford and Johnny Cash. My chief complaint about “Spirited Republic” is its inattention to drinking culture, at least among ordinary Americans. However, the last wall does feature a mishmash of artifacts from diplomatic drinking culture, such as F.D.R.’s cocktail shaker, Gerald Ford’s wine glasses, and alcohol-related gifts to Ronald Reagan (a decanter) and Bill Clinton (a statue of a Cossack straddling a wooden cask) from foreign dignitaries. Plus, if you’ve ever wanted to see Richard Nixon’s whiskey face, a video montage of presidential toasts is on repeat near the exit. The exhibit also curiously sidesteps the ongoing prohibition of other psychoactive substances, especially considering that its promotional pamphlet claims the story of alcohol “echoes today’s debates on… the legalization of drugs.” Bait-and-switch aside, I can appreciate this sober appraisal of an often sensationalized topic. 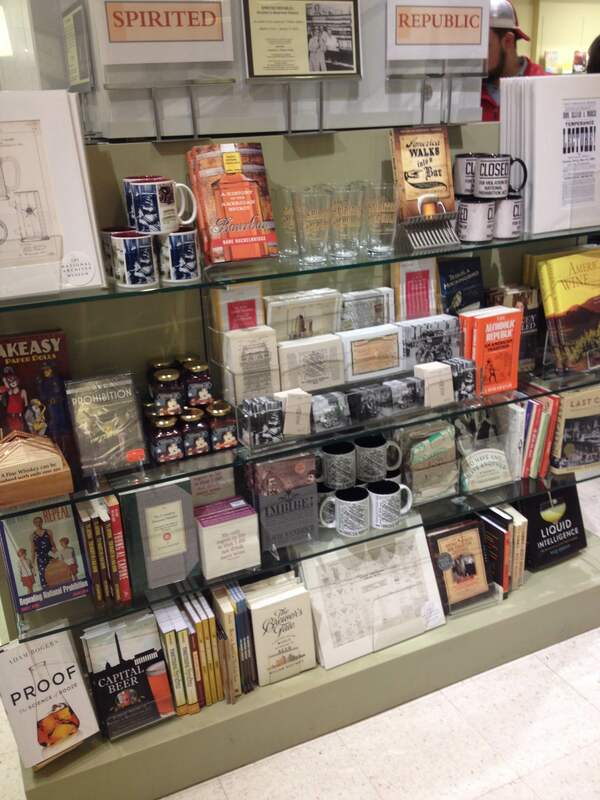 But when visitors exit to peruse the gift shop, hopefully they’ll purchase or at least thumb through a thorough, more nuanced book about alcohol in American history. If not, they may come away with the pervasive impression that the past is an impersonal march of progress. The history of alcohol and drugs, with their attendant legal and public health debates, should instead emphasize the critical influence of human agency. Anyone spot their own work? This is a wonderful exploration of a rather detailed, and at times vague, exhibit. One issue I felt the exhibit additionally lacked was an exploration of how alcoholism is a problem in poorer communities, namely on Native American Reservations where alcoholism and its affects are a contested issue. It was clear when speaking with a tour guide that the exhibit was an attempt for the National Archives to approach a younger demographic, and I agree that with this intent a better comparison to today’s drug legalization debates would have been both relevant and beneficial. Very interesting. One of the major problems many museums face is the amount and type of information to display that can be affected by how the museum is funded and the need to not offend them.